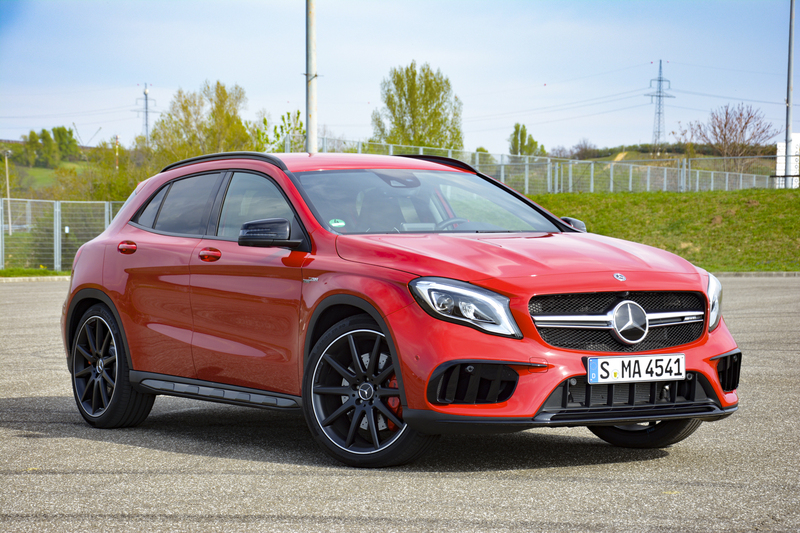 The Mercedes-AMG GLA45's firecracker of an engine and slot car-like handling will make you fall in love with driving again. A few years ago, Mercedes-Benz embarked on a compact car offensive in a bid to lure new, younger buyers into showrooms. The A-Class was reinvented as a sleek hatchback aimed right at the Audi A3, and it was joined by new additions named CLA, CLA Shooting Brake, and GLA. The B-Class remained what it has always been: a people-mover that puts a much bigger emphasis on practicality than sexiness. That's why there's no such thing as a B45 AMG, and there likely never will be one unless an enthusiast decides to perform the transplant on his or her own. Please send us pictures if you do. Some of the aforementioned nameplates might not sound familiar because they're on the part of the Mercedes-Benz iceberg we don't see in the United States. The CLA Shooting Brake and the A-Class aren't sold here, while the B-class is offered in strictly limited quantities with an electric motor under the hood instead of a four-cylinder engine. The GLA and the CLA are the compact cluster's global stars. Both are what executives proudly call conquest models. Dynamic, stylish, and comfortable, they bring first-time Mercedes buyers into showrooms and turn affluent young buyers into life-long customers. In a segment where image and numbers are of utmost importance, Mercedes-Benz needs to be quick on its feet. The GLA originally debuted in 2013, and it's receiving a mid-cycle update for the 2018 model year. Raucous and sprightly, the GLA45 is the rebel punk rocker of the family. 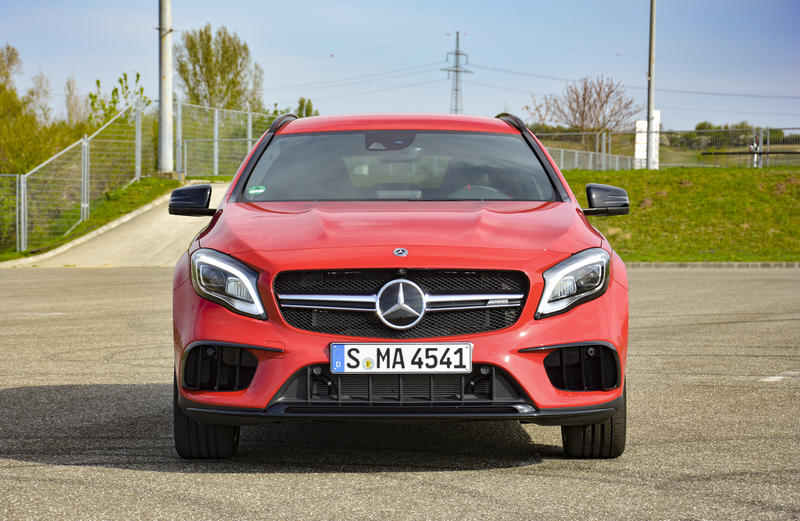 A nip-and-tuck gives it a redesigned front bumper with vertical slats, a heritage-laced styling cue that's becoming increasingly common across the AMG lineup. 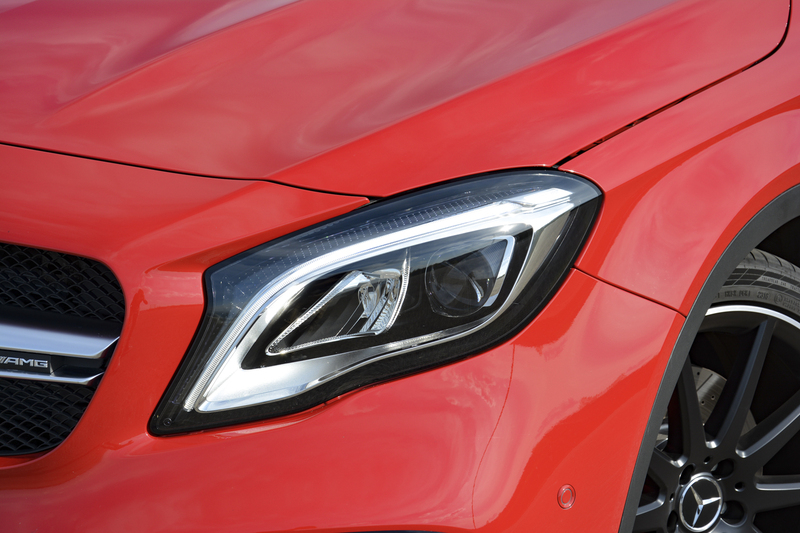 The headlights get a new design, and LED lighting now comes standard. 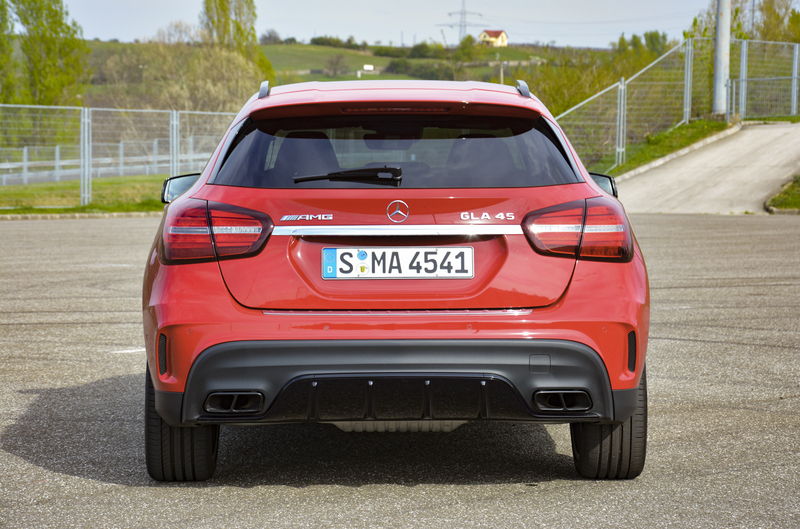 Around back, the GLA features a more muscular-looking air diffuser integrated into the bumper and a revised spoiler. The updates are minor, but they're enough to keep Mercedes' smallest crossover looking fresh. More important changes are found under the hood. 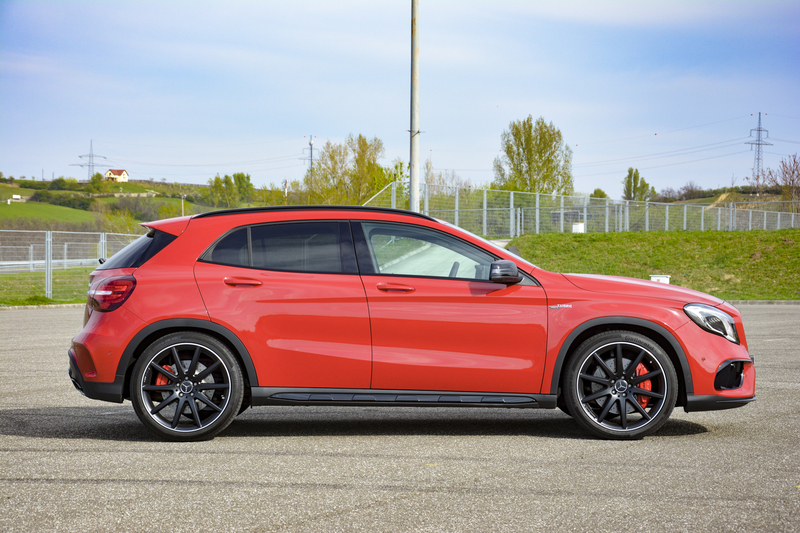 While the GLA45 carries on with a turbocharged, 2.0-liter four-cylinder engine, its output has been generously bumped up to 375 horsepower at 6,000 rpm and 350 pound-feet of torque over an appreciably broad range that stretches from 2,250 to 5,000 rpm. Those figures represent increases of 15 horses and 18 pound-feet of twist over the outgoing model. The hand-built turbo four still spins all four wheels through a seven-speed dual-clutch automatic transmission, but gear ratios three to seven are now shorter to improve acceleration. 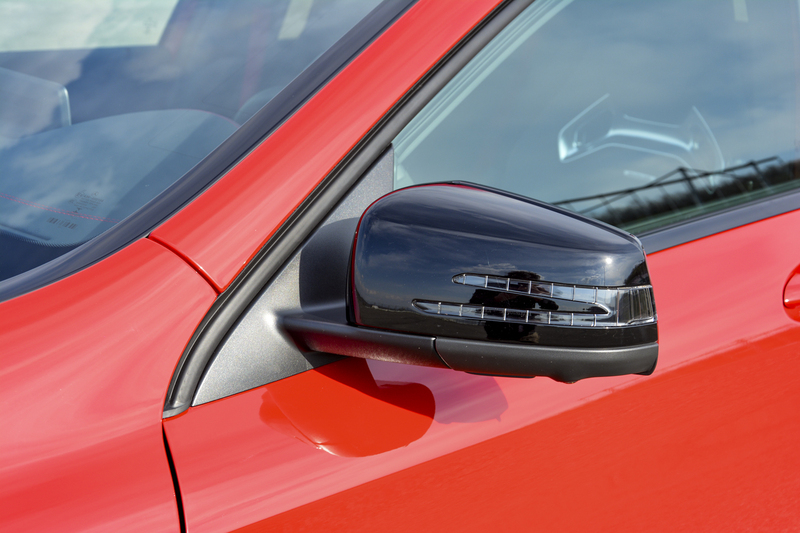 The extra power is perceptible, and blasting to 60 mph from a standstill now takes a scant 4.3 seconds. The GLA45 is a mono-spec model. The list of standard features includes a power-operated tailgate, LED headlights, power front seats with a memory function, cruise control, remote start, keyless start, dual-zone climate control, 19-inch alloy wheels wrapped by low-profile tires, and aluminum roof rails. 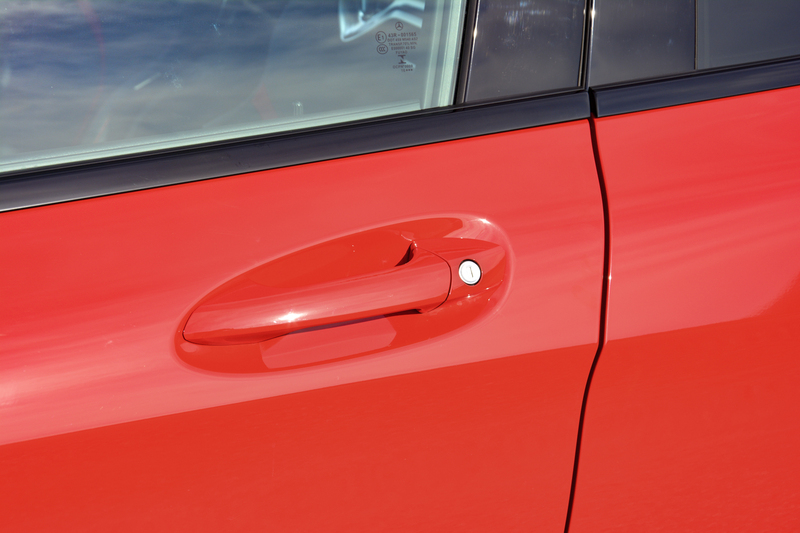 Buyers can choose between red or silver accents in the cabin. Want more? Extra-cost options include a 12-speaker Harman Kardon sound system, a sport suspension, Android Auto compatibility, a panoramic sunroof, and ambient lighting. There's also a Dynamic Plus package that brings go-fast goodies such as a limited-slip front differential. Buyer beware: the GLA45's price goes up at the speed of light when you start piling on options. The infotainment system is displayed on an eight-inch high-resolution screen that pops out from the top of the dashboard like a television in a swank hotel room. Mercedes told us mounting the screen on the dash instead of embedding it into the center stack facilitates the task of updating the software when new technology becomes available. Poking at the screen is futile; the infotainment system is controlled via a knob located on the center console. It's right behind the dial used to select a driving mode, a setup that takes a little bit of getting used to. On a few occasions, we tried to zoom out of the map while keeping an eye on the road ahead and ended up putting the car in comfort mode instead of sport. The infotainment dial is much bigger than the driving mode dial, so the confusion would likely subside after driving the GLA daily for a few days. The infotainment system is one of the better units on the market. The graphics are top-notch, the menus are clearly labeled, and the software is straight-forward to navigate. We like that the system responds to input with very little lag. Key information (like navigation directions) is also displayed in a smaller screen flanked by big, legible analog gauges. A 12-volt outlet at the very bottom of the center stacks keeps mobile devices topped up. However, there's not a lot of space in the center console to store your smartphone or your MP3 player. They either have to go in the small storage space next to the outlet, or occupy real estate in one of the cup holders. More than ever, Mercedes come in all shapes and sizes. All of them share at least one thing in common: they'll make you feel like a million bucks when you're sitting behind the wheel. 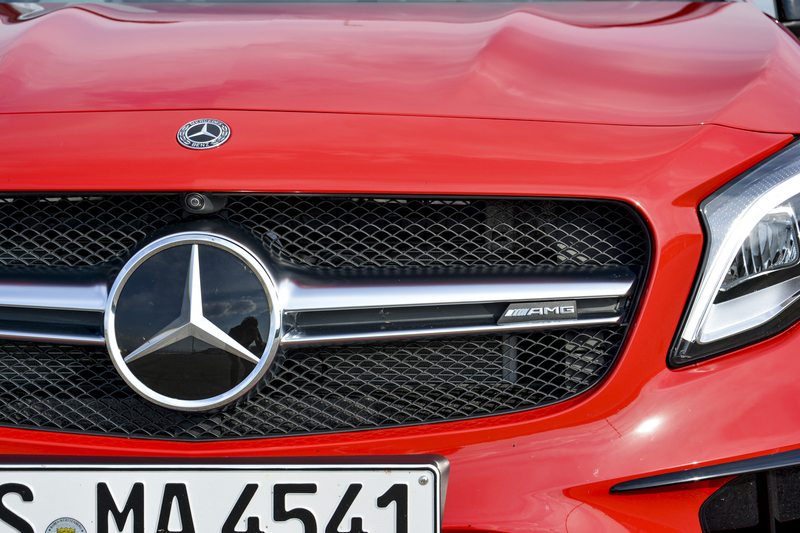 And, for the most part, the GLA45 lives up to the three-pointed star emblem on its nose. 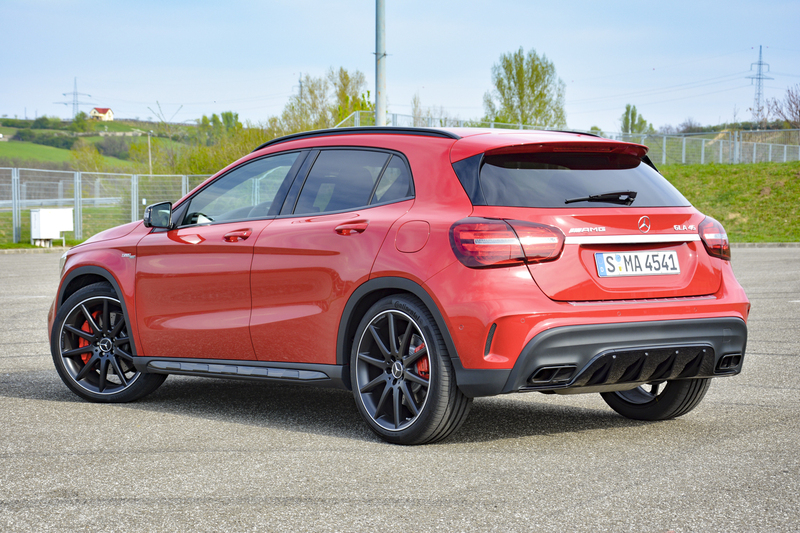 Remember: the GLA45 is a relatively new type of Mercedes. It's not your grandpa's old 190E and it's not the CLK you lusted after in college, so there's no wood trim to be found anywhere in the cabin. Instead, the dashboard is dominated by a decorative piece of trim with red and gray graphics and a discreet AMG emblem, lest your passengers forget what they're riding in. Round air vents inspired by the world of aviation feature red bezels, while the red contrast stitching adds both a dash of color and a touch of elegance to the overall ambiance. Most of the materials feel upmarket, but some of the plastic bits around the shift lever are disappointingly low-rent; that might be acceptable in the standard GLA, but we feel the 45 model deserves to benefit from improved materials. It's about as expensive as a base E-Class, after all. The three-spoke, multi-function steering wheel is upholstered in an attractive combination of leather and Alcantara. Red stitching around the rim keeps the sporty, upmarket theme going, but the 12-o'clock mark on the wheel is complete overkill unless your daily commute involves drifting on a frozen lake in Sweden. We wish Mercedes had given the center stack a makeover. The panel of buttons looks dated, and we doubt anyone will write the brand a tempestuous letter if the dial pad disappears. The few buttons that are necessary could easily be combined with the HVAC controls to form a sleeker-looking unit that takes up less space. Sound familiar? It's because that's exactly what Mercedes has done with bigger models like the newest C-Class. 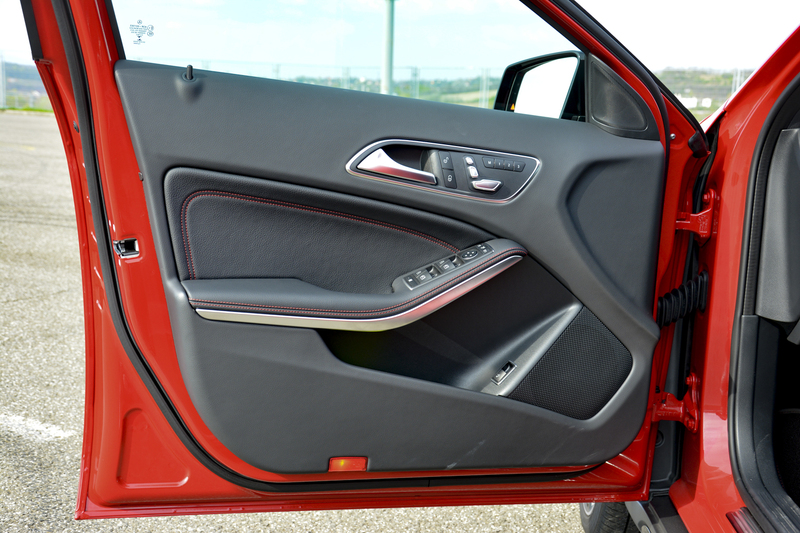 The transversally-mounted engine allowed Mercedes designers to clear up a generous amount of space in the cabin. The passengers sitting in the front enjoy ample leg, head, and elbow room. Our tester came equipped with the optional front sport seats, which provide a great deal of lateral support at the expense of comfort on longer drives. 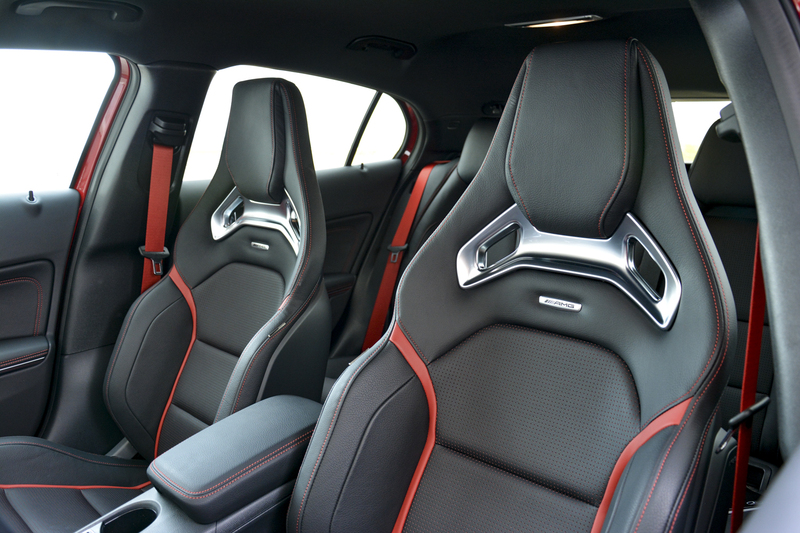 If impromptu road trips are your thing, we'd recommend sticking with the stock front seats. 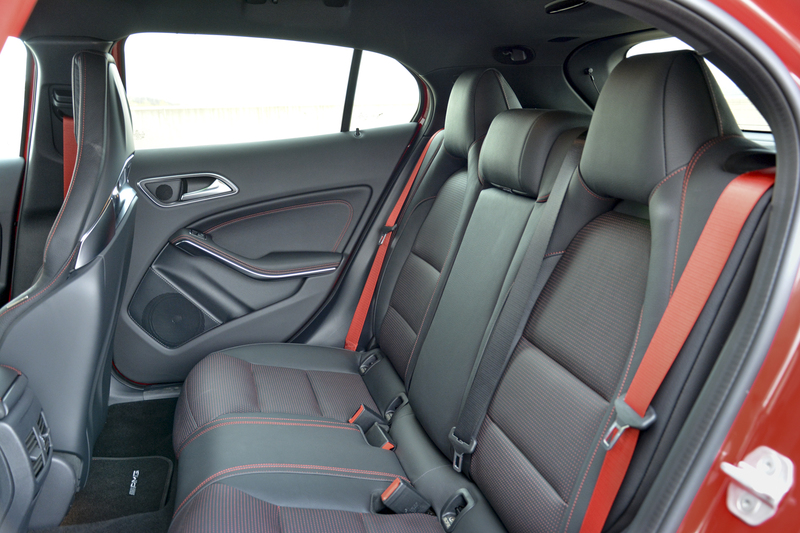 Two adults comfortably fit on the GLA45's rear bench. That's partly because the crossover's longer roofline and more squared-off proportions give it a passenger compartment that's much roomier than the swoopy CLA's. It's possible to fit a third person back there, but the middle seat is best enjoyed when used with moderation, especially if the friends you're carrying around fit in the big and tall category. 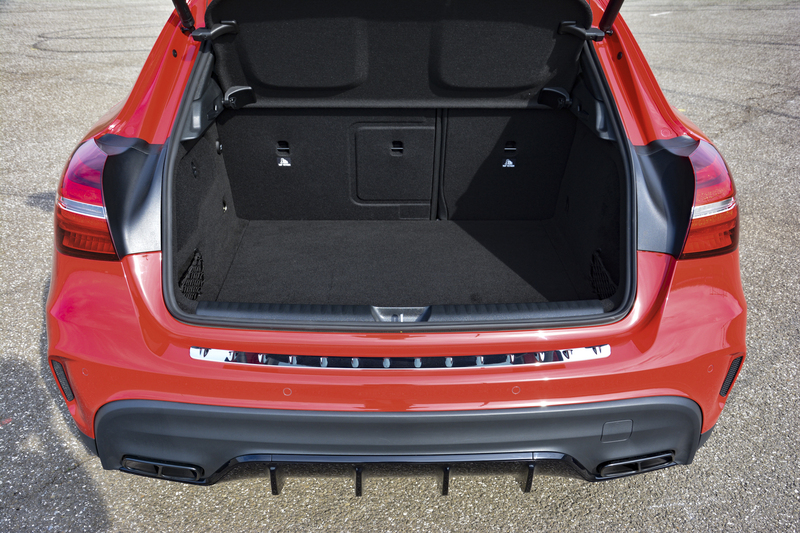 Trunk space checks in at 17.2 cubic feet, which is respectable given the GLA's compact footprint. Folding the rear seats down yields 43.6 cubes. It's no Suburban, but with just two adults on board it'll comfortably haul a few boxes from Ikea. The GLA45 isn't content with just turning the dial up to 11. It rips out the dial, takes a sledgehammer to the boom box, and hurls it in front of a moving train. The engine comes to life with a boom and settles into a low burble - the battle cry of the world's most powerful series-produced four-cylinder. 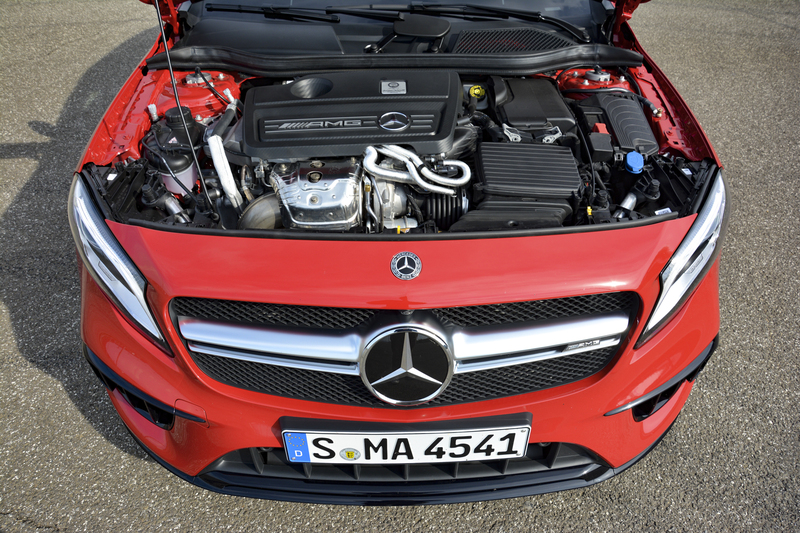 Like every AMG engine, the GLA45's turbo four is hand-built by one technician from start to finish. A plaque bearing the builder's signature adorns the engine cover. AMG's smallest model is like Gibson's Flying V guitar: equal parts show and go. It's as quick as you'd expect a relatively light, 375-horsepower crossover to be. 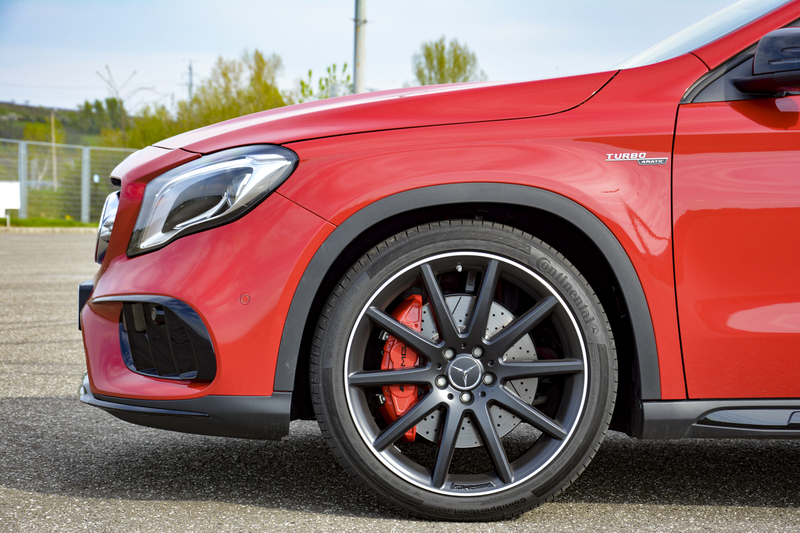 Torque builds up fast so the GLA45 shoots off the line like a bottle rocket, and acceleration becomes explosive the second the turbocharger begins spooling up. The four-cylinder pulls all the way up to the redline without running out of breath. Left in drive, the dual-clutch transmission fires off smooth, mind-bogglingly fast shifts. There's the option of shifting manually with the steering wheel-mounted paddles, which is helpful when preparing to pass a blue smoke-bellowing Trabant putting along at half the speed limit. Otherwise, the transmission is good at finding the right gear at the right time and it rarely hesitates, even with seven gears to choose from. We were content leaving it in drive during most of our time behind the wheel. 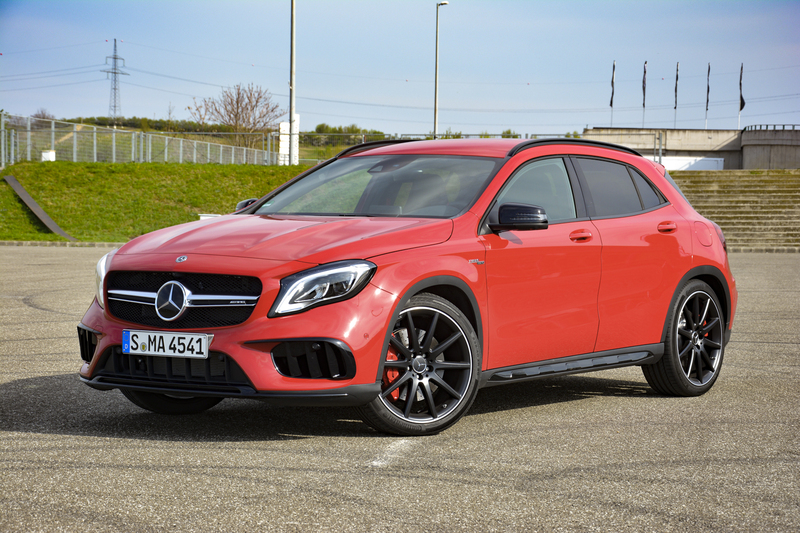 Acceleration is only one facet of the GLA45's personality. Our drive through the rolling hills of the Hungarian countryside gave us the opportunity to explore its handling prowess. A compact-specific version of Mercedes' time-tested 4Matic all-wheel drive system distributes power between the front and rear axles as it's needed. Grip is excellent, even on wet surfaces. The GLA is gifted with the kind of dynamic, confidence-building handling that chassis engineers could only dream of 20 years ago. However, four-wheel drive isn't for off-road shenanigans; get a standard GLA with the Off-Road Package if that's what you're after. Like all of its peers, the 45 is strictly for on-pavement use because it's far too low to go anywhere off the beaten path. The trade-off is that the stiff, sport-tuned suspension makes AMG's smallest model highly adept at high-speed corner-carving. It feels like it's on a bobsled run as you hoon it down a winding road, taking corners one flick of the steering wheel at a time. The steering is precise and ultra-quick, but it's a little bit light in comfort mode for our liking. Luckily, there's a driving mode named individual that lets you create your own custom mode from scratch. You can leave the mother-in-law-friendly comfort setting for the suspension while dialing in the better, heavier steering from sport plus. Or vice versa, if that best suits your driving style. Even in sport mode, the suspension is compliant enough not to crush your spine one Hungarian cobblestone at a time. And there's only one mode for the brakes: powerful, with very little fade. The EPA hasn't posted fuel economy figures for the updated 2018 GLA45, and our drive was too short to observe real-world mileage. For what it's worth, last year's model returned 22 mpg in the city, 28 mpg on the highway, and 25 in a combined cycle. Safety is one of Mercedes' hallmarks. The GLA45 comes standard with eight airbags, adaptive braking, hill-start assist, and a rear-view camera. Lane-keeping assist and Distance Pilot technology are both found on the list of extra-cost options. Style and luxury make Mercedes' crop of compact models highly desirable. As AMG's gateway drug, the GLA45 turns the distortion up by injecting a dose of pure, undiluted performance to the mix. 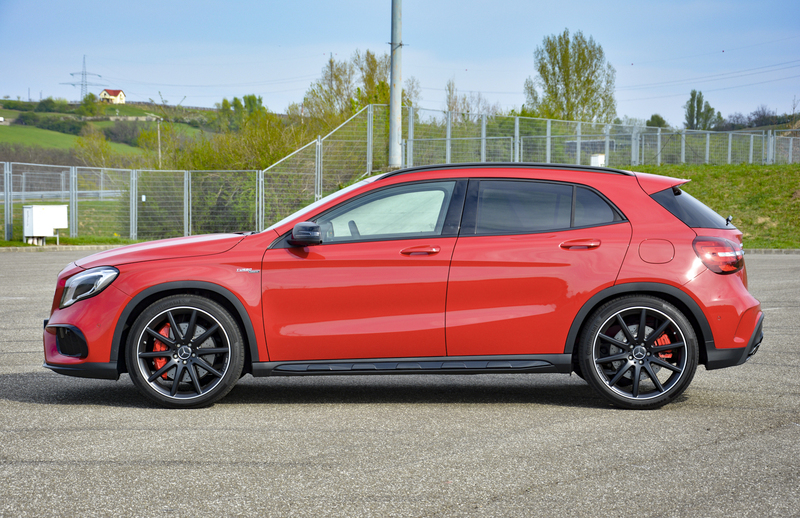 The GLA45 is a good example of "what if?" thinking; before it debuted, AMG wasn't sure if launching a small, four-cylinder-powered model was the right decision to make. 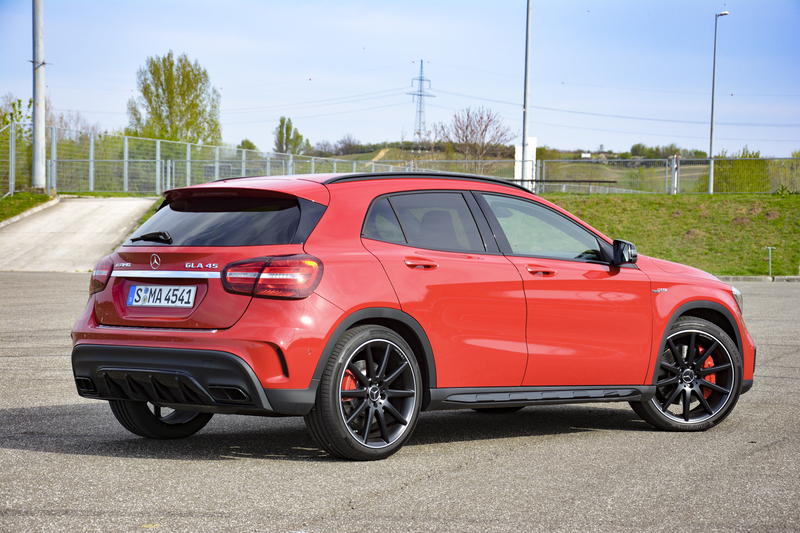 They've nailed it: the 375-horsepower turbo four is a masterpiece of engineering, and the GLA45 is a nimble, pocket-sized hot rod that will make you fall in love with driving again.